I absolutely love pasta and the creamy goodness that comes along with it. I however do not like the fat and how it sticks to my body from that creamy goodness. Therefore, I set out on a quest to convert some of my pasta recipes that call for butter and a lot of heavy whipping cream. For this recipe I substituted Greek yogurt and skim milk for the butter and heavy whipping cream. It came out perfectly!! I must thank my friend from Bulgaria, Katie, for encouraging me to switch over to Greek yogurt in my cooking. She told me about all the different dishes she makes using just Greek yogurt, and I became hooked and had to try it myself. Thank you Katie! Add water to a large pot and boil pasta in it till it is al dente following the package directions. In the mean time, heat a large skillet over medium-high heat. Add olive oil and sauté the chicken until completely cooked. While the chicken is cooking, prepare the sauce for the pasta. Combine the milk, flour, yogurt, and creole/Cajun seasoning. Set sauce aside for later. Remove the chicken from the pan and set aside for later. 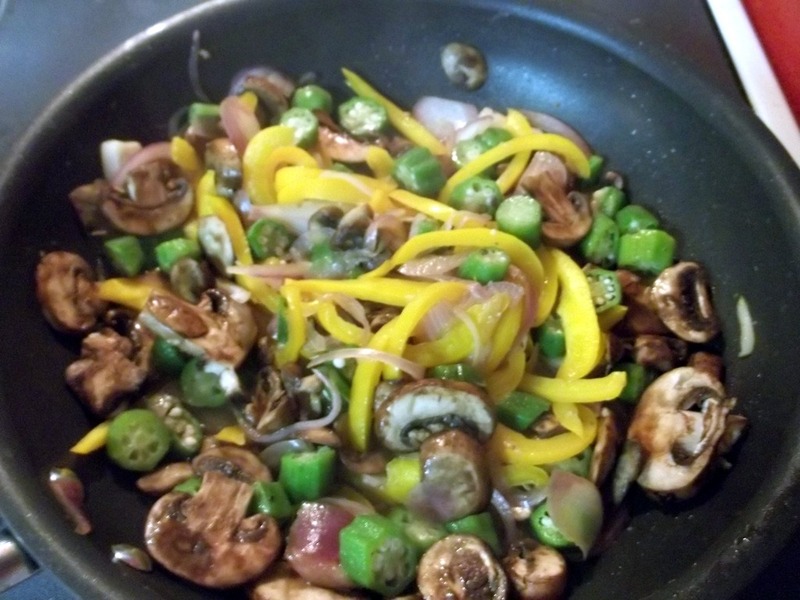 Add a little more olive oil to the pan and add bell peppers, onions, and mushrooms. Sauté until the veggies are tender. Add the frozen okra about half way through the veggies cooking. Then, add the minced garlic and cook for another minute. Reduce the heat to medium-low. Add the chicken broth and the sauce prepared earlier. Allow sauce to reduce for 2-5 minutes while occasionally stirring. 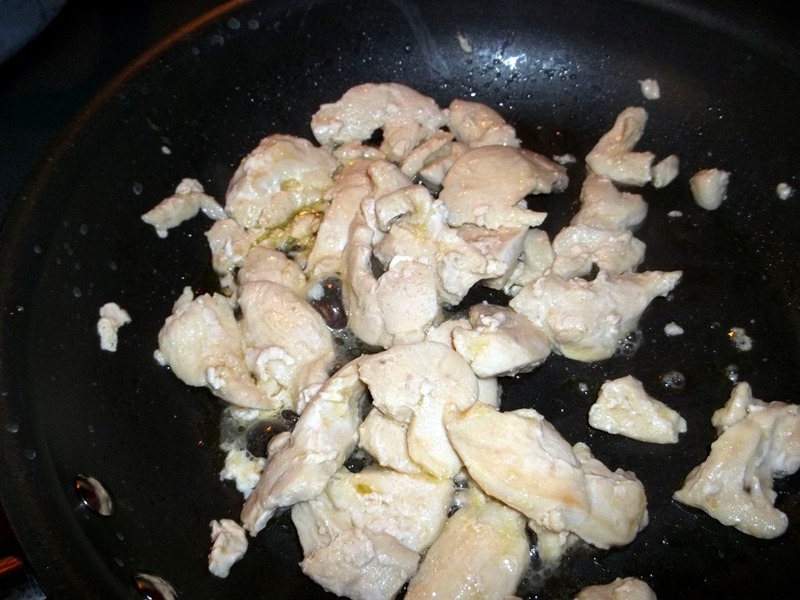 Return the cooked chicken to the pan. Add salt and pepper to taste. In a large serving bowl add the cooked pasta. Pour the chicken and veggie mixture with sauce. Lightly toss to coat the pasta. I have the diced tomato, scallions, and jalapeno in separate bowls so everyone can garnish their pasta to their liking. Enjoy!! Add water to a large pot and boil pasta in it till it is al dente following the package directions. In the mean time, heat a large skillet over medium-high heat. Add olive oil and sauté the chicken until completely cooked. While the chicken is cooking, prepare the sauce for the pasta. Combine the milk, flour, yogurt, and creole/Cajun seasoning. Set sauce aside for later. Remove the chicken from the pan and set aside for later. 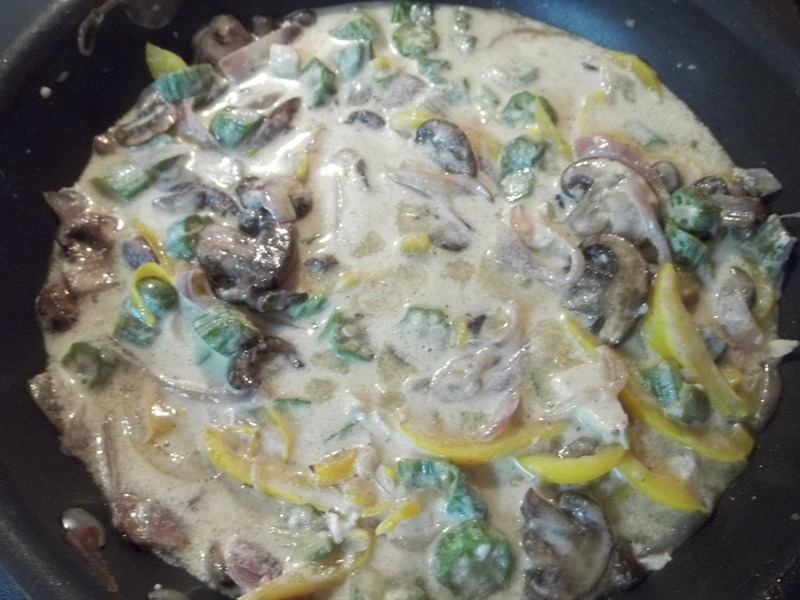 Add a little more olive oil to the pan and add bell peppers, onions, and mushrooms. 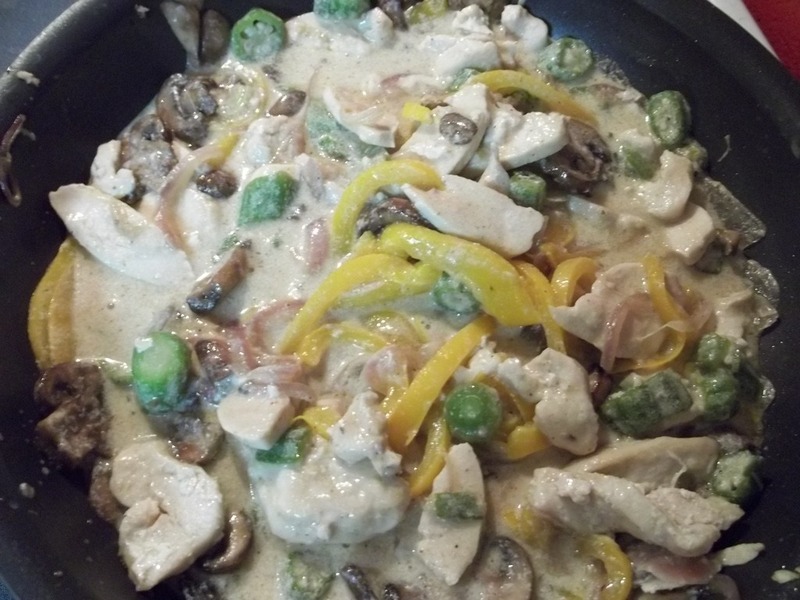 Sauté until the veggies are tender. Add the frozen okra about half way through the veggies cooking. Then, add the minced garlic and cook for another minute. Reduce the heat to medium-low. Add the chicken broth and the sauce prepared earlier. 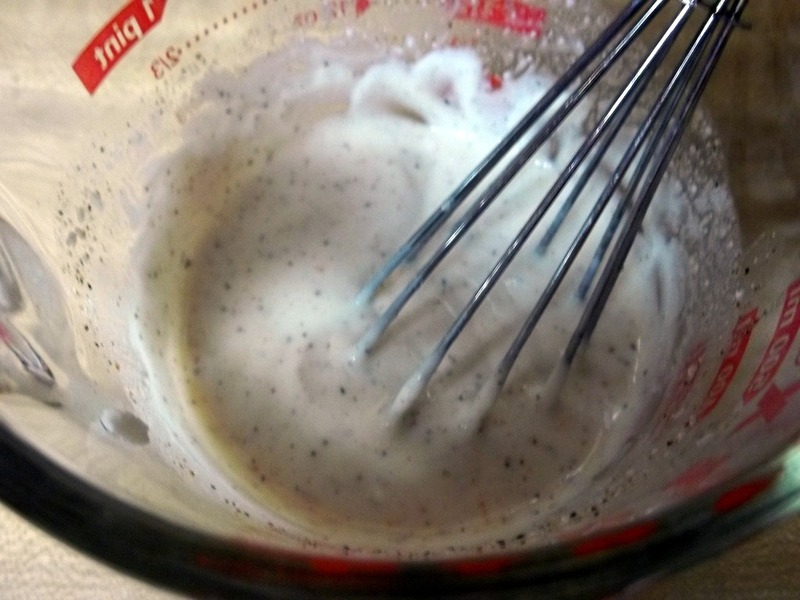 Allow sauce to reduce for 2-5 minutes while occasionally stirring. Pour the chicken and veggie mixture with sauce. Lightly toss to coat the pasta. I have the diced tomato, scallions, and jalapeno in separate bowls so everyone can garnish their pasta to their liking. Enjoy!! 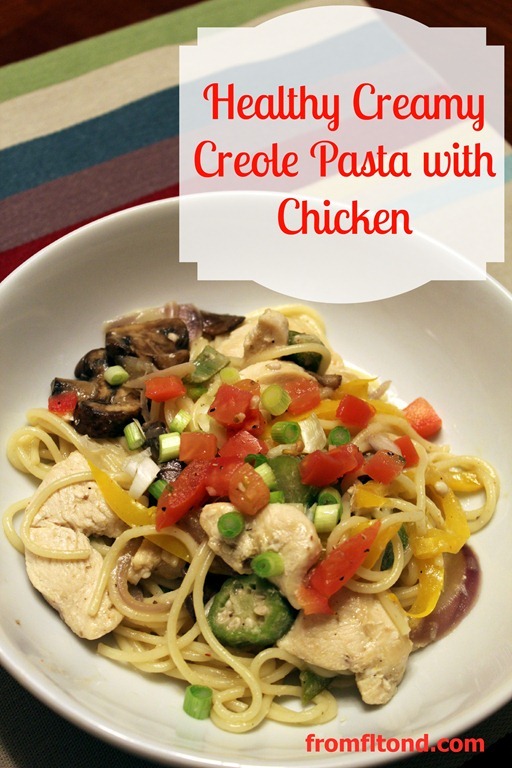 This entry was posted in Dinner, Recipes and tagged cajun, chicken, creamy cajun pasta, creamy creole pasta, creole, healthy creamy creole pasta with chicken, healthy creamy pasta, pasta on December 11, 2012 by fromfltond.